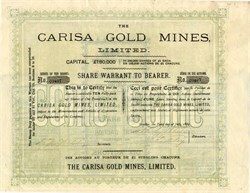 Beautiful uncancelled certificate (13 x 17”) from the Carisa Gold Mines Limited issued in 1889. This item has the signatures of the Company's Director's, W. L. White and Secretary, G. H. Hildy and is over 118 years old. 12 coupons attached on bottom. Black print on green underprint. Half in English and French. The Carisa mine is located near Marysvale in Juab County. Today the mine is owned by Unico Inc as part of the Deer Trail claim group. Very fine condition.